Manchester United's Patrice Evra says he is ready to fight for his place in the team with new signing Alex Buttner. The France international left-back, 31, welcomed the extra competition for places and questioned whether their squad was strong enough last season. Buttner, 23, who in August, impressed on full debut, scoring a goal. But Evra said: "If someone is there or not I will fight because you have to respect the shirt." Buttner is likely to be selected in Wednesday's Capital One Cup third-round tie with Newcastle. Sir Alex Ferguson has described Buttner, who is yet to be capped by the Netherlands, as one of the "best young left-backs in Europe". 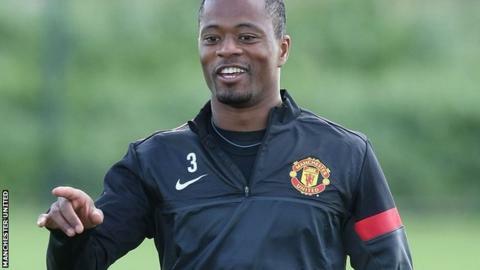 Evra, 31, signed for Man Utd in 2006 from Monaco, making over 290 appearances and winning four Premier League titles. He added: "When you play for Manchester United that is the big challenge. Maybe last year there wasn't enough competition on every part of the pitch. "They forget how I got to become Manchester United's left-back. I fought with two great players in Gabriel Heinze and Mikael Silvestre."